While most of us would choose a donor bike for a custom project based on whatever cool whim may be currently tickling our fancy, it’s important to remember that many bike lovers the world over aren’t able to get their hands on a well loved CB Honda, Yamaha SR, or antique BMW boxer at the drop of a hat. With the notable exception of Japan, the Asian bike market has long been turf owned by small capacity scooters rather than the large-capacity bikes favoured by the West. 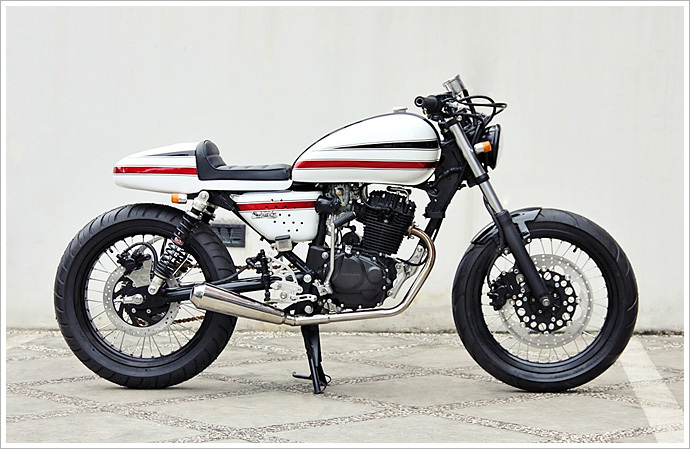 So what do you do when all you want is a sweet, 70’s inspired café racer that will turn a few heads and the only bike you have handy looks like an cheap extra from a Transformers movie? You call StudioMotor, that’s what.